This Authentic Instant Pot Chicken Tinga recipe is a flavor bomb! Bone-in chicken cooked with a vibrant combination of spices results in a delicious chicken filling that you can use to make chicken tinga tacos, tostadas, burritos, nachos, enchiladas or a chicken tinga rice bowl. Add your choice of toppings including queso fresco, salsa, guacamole, onions and cilantro! Chicken Tinga is an authentic recipe that comes from the state of Puebla in Mexico, which is also known for mole. 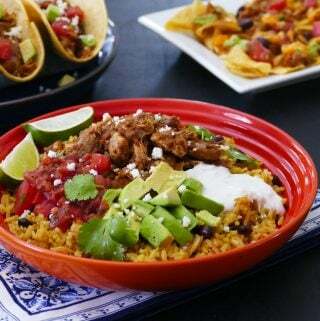 Chicken Tinga is a shredded chicken dish that’s cooked with smoky chipotle peppers, onions and tomatoes. 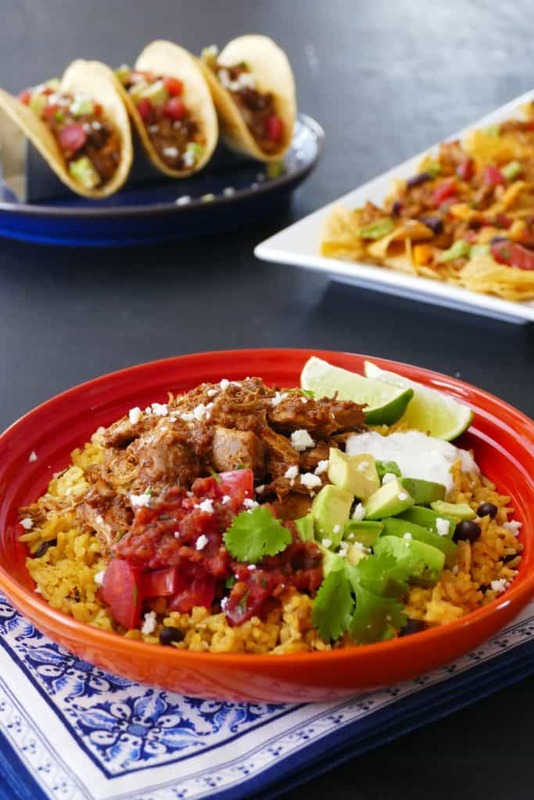 Instant Pot Tinga can be made with pork, chicken or beef and it can be served in tacos, burritos, enchiladas, on a tostada or nachos, or as part of a rice bowl. My two favorites are chicken tinga and pork tinga. When I make Instant Pot pork tinga, I fry up some chorizo to combine with the pork – it’s pretty delicious! 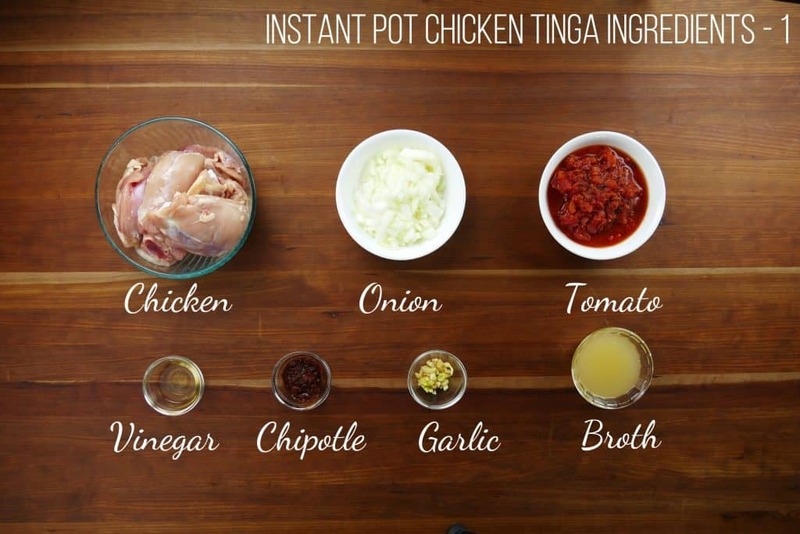 But today’s recipe is for Instant Pot Chicken Tinga. Those of you who’ve been following my blog for a while know that I have high standards for what I publish. Nothing less than two thumbs up makes the cut. So that means “okay” doesn’t cut it! When I first made the Instant Pot Chicken Tinga, the taste testers (my ever-patient family) said it was “okay, not bad, tastes like chicken”. Oh no – those are dreaded words for a food blogger! I was on a mission to improve the recipe because I knew I could get from just “okay” to “mmmm, really good, delicious”! I ended making it a few more times, trying to perfect the recipe. In the end, I had to make 4 incremental changes compared to the first time I made the recipe: decreased the liquid, increased the spices, reduced (i.e. boiled down) the sauce, and sauteed the shredded chicken. What all that does is it makes the chicken super flavorful! The end result is perfect Instant Pot Chicken Tinga – I hope you love the recipe as much as I do! Pressure cooking time for the chicken thighs or drumsticks can vary depending on the size of the chicken pieces. For larger pieces, you may need to increase cooking time by 1 or 2 additional minutes. I highly recommend using bone-in chicken thighs and drumsticks. But if you decide to use boneless chicken thighs, pressure cook them for about 8 to 9 minutes. I like to add brown sugar in this recipe because I like to balance out the flavors: salty, sour, spicy and sweet flavors make a perfect combination. Feel free to omit the sugar. For many years I’d been buying cans of Chipotle Chiles in Adobo Sauce, and I would freeze the leftover chilies for later use. But now I’ve discovered Diced Chipotle peppers which come in a glass jar. It’s very convenient and easy to use and keeps in the fridge for a long time. That’s what I use in this recipe. I have a secret sauce that I’ve concocted that I use for all kinds of foods including Middle Eastern and Mexican. It keeps in the fridge really well. I love using it on tacos and rice bowls! This recipe would be perfect for a taco bar if you’re entertaining. It’s easy to pressure cook the chicken ahead of time and saute on the day of your party. 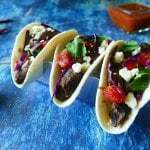 You can offer alternate options and serve Instant Pot Carne Asada and/or Instant Pot Pork Carnitas as fillings. I recently purchased a Vitamix blender that also has a mini-blender attachment. It was a pricey investment but I am so happy with it. It blends everything so quickly and thoroughly! 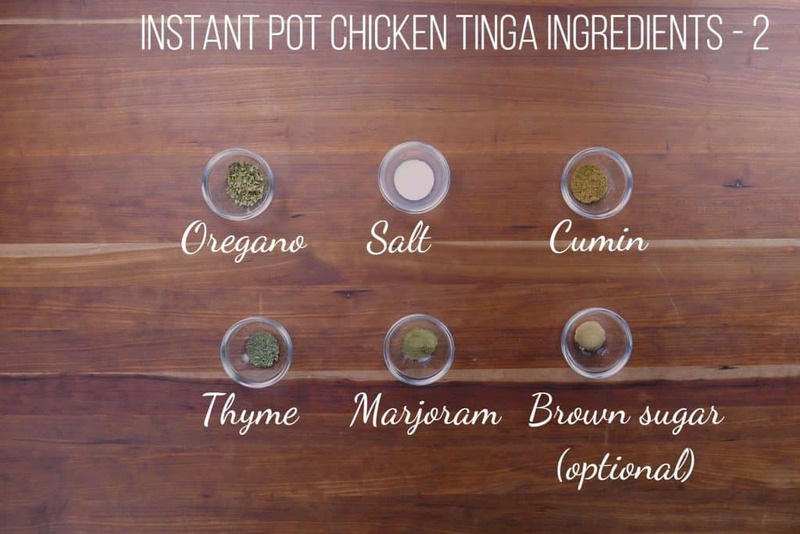 Reducing the sauce and sauteing the chicken adds a lot of flavor to the Instant Pot Chicken Tinga. I suggest using a splatter screen when you reduce the sauce because there will be a lot of bubbling up while the liquid evaporates. Although sauteing the chicken is optional, I do recommend doing this step. I love the crispy bits and caramelization! 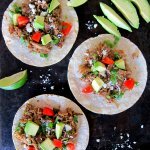 If you’re new to the Instant Pot and aren’t familiar with how to use it, please read the Instant Pot DUO Beginner’s Quick Start Guide or the Instant Pot ULTRA Beginner’s Quick Start Guide first and then come back here to learn how to make Instant Pot Chicken Tinga for tacos, burritos, tostadas or a Mexican rice bowl. Add onions, tomatoes, vinegar, garlic, chipotle chiles, oregano, marjoram, salt, thyme, cumin, and brown sugar to a blender jar. Blend until it forms a smooth paste. Add broth, chicken, and blended sauce to the Instant Pot inner pot. Press ‘Manual’ (or ‘Pressure Cook’) and ‘+’ or ‘-‘ until the display reads ‘12′ (12 minutes). Select Pressure Cook mode and adjust the time to 12 minutes (00:12). Instant Pot display will change to ‘On’. Once the Instant Pot is pressurized, the float valve will go up. The display will count down from 12 to 0; it will then switch to ‘Keep Warm’ mode and display ‘L0:00’ or ’00 00′ and begin to count up. Press Cancel and open the Instant Pot. * If you wish, you can release any remaining pressure after 15 minutes. Using a slotted spoon, transfer the chicken from the inner pot into a large bowl and set aside. Select ‘Saute’ mode and reduce the sauce until thickened, about 7 to 10 minutes, stirring occasionally. To prevent splatter from the bubbling sauce, use a splatter screen to protect your countertops. Shred the chicken using two forks. Add in desired quantity of sauce, about 1/4 to 1/2 cup. Mix the chicken and sauce. Heat a large frying pan over medium-high heat and add vegetable oil. Spread out the shredded chicken on the frying pan and add more sauce if desired. Saute the chicken until brown bits form on the bottom, stirring gently occasionally. Serve in tacos, enchiladas, burritos, on nachos or as part of a rice bowl with any of the toppings described in the tips section above. This Instant Pot Chicken Tinga recipe is perfect for tacos, tostadas, enchiladas, nachos, a rice bowl or taco salad. Packed with flavor, the recipe is adapted from an authentic Mexican recipe made in the slow cooker. Perfect for meal prepping, the chicken can be pressure cooked ahead and sauteed when you're ready to eat. Combine onions, tomatoes, vinegar, garlic, chipotle chiles, oregano, marjoram, salt, thyme, cumin, and brown sugar in a blender and blend until smooth. Combine chicken broth, chicken, and blended sauce in the Instant Pot inner pot. Close lid and pressure cook for 12 minutes on high pressure. Allow for a Natural Pressure Release (NPR). If you wish, you can release any remaining pressure after 15 minutes. Using a slotted spoon, transfer the chicken from the inner pot into a large bowl and reserve. Select 'Saute' mode and reduce the sauce until thickened, about 7 to 10 minutes, stirring intermittently. To prevent splatter from the bubbling sauce, use a splatter screen to protect your countertops. Shred the reserved chicken using two forks. Add in desired quantity of sauce (about 1/4 to 1/2 cup) and stir together the chicken and sauce. Spread out the shredded chicken on the frying pan without overcrowding. Add more sauce if desired. Saute the chicken until brown bits form on the bottom, stirring gently occasionally. Add more sauce as needed. Transfer chicken to a serving bowl. Serve with tortillas, rice or salad and your choice of toppings. Prep time does not include steps that are already accounted for in the ingredient list, e.g. skinned chicken, chopped onions, minced garlic, etc. * sauteing of chicken is optional, but I recommend it! See the blog post for more detailed recipe tips. I am not a certified nutritionist. I provide my best estimate of nutritional information merely as a courtesy to my readers. If you depend on nutritional information for dietary or health reasons, I suggest using your favorite online nutrition calculator to confirm the nutritional value of this recipe based on the actual ingredients that you use. 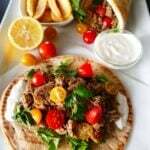 If you loved this recipe, please give it a 5 Star rating in the comment section below and please share it on social media using the social media share buttons at the top and bottom of this post. Thank you so much! Thanks Roslia! Hope you enjoy it. This is the best thing I’ve made in months! So flavorful. So easy. I left out the sugar and it was still amazing. I almost skipped the extra step of sautéing the meat. I’m so glad I did the extra step, it added an entire new depth of flavor. This is another great recipe from Paint the Kitchen Red. This has become my go-to website for instapot, as the recipes are always reliable and have never disappointed the family. Thank you!